When we send our kids to school, we want them to receive the best education. Having a healthy lunch to eat is a big part of that. But, if you choose to buy convenience packages of snacks and desserts as well as lunch meat, sack lunches can quickly become an expensive endeavor over the course of a year. Especially if you’ve got a hungry teenager. If you’re looking to curb costs, consider some of these frugal sack lunch ideas. Mix and match to make tasty, healthy, low cost lunches for your kids all day long. We’ve found that the best place to buy lunch ingredients is at big warehouse clubs like Sam’s or Costco. For instance, at Costco, you can buy a 10 lb. bag of organic carrots for $5! Or, you can buy a big bag of potato chips for less than $4, which is much less than you’d pay at the grocery store. You just need to take the time to bag these items in individual portion sizes. If you look at the suggestions above and think there’s no way you’d have time to prepare a lunch from scratch every day, especially if you have multiple kids, you’re probably right. Most of us don’t have that kind of time early in the morning. Instead, prep all of the lunch ingredients for the week on the weekend. Have them all packed and ready to go in the pantry and the refrigerator so you or your kids just simply have to grab them and pack them in the early morning rush. Or, to be safe, prep on the weekend and prepare the lunches every night so you just need to grab them from the refrigerator in the morning. 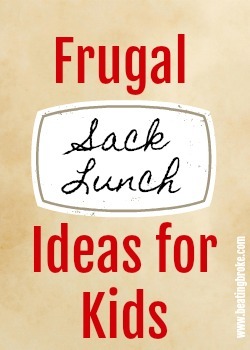 Feeding your kids a brown bag lunch can be affordable. . .if you choose the right ingredients, and use these frugal sack lunch ideas. How do you save money on your kids’ sack lunches? My son loves egg salad so my wife will often whip up a batch and we can make him sandwiches for a few days off that.